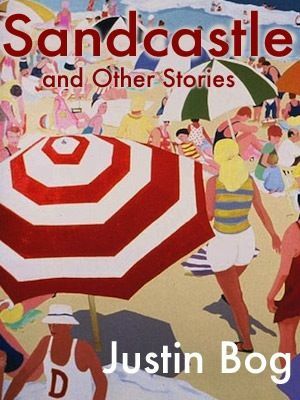 My first book, Sandcastle and Other Stories, was published by Green Darner Press—please check out the beautiful paperback they created; it’s perfect for all readers from your literary hound to suspense junkies, thriller chillers, New Yorker types, down to high school short story lovers—and the responses I received over the past two years were energizing and humbling at the same time. I hope everyone reading the stories enjoys them as much as I enjoyed writing each one. Short Fiction is a tougher sell than genre novels. I hear this from good friends: “I don’t read short stories, Justin.” I am thrilled that Alice Munro won the Nobel Prize for Literature as a short story writer. Some of her short stories encompass entire lives, worlds. A little part of me winces whenever someone says they don’t enjoy reading shorter tales—there’s always an easy excuse why they don’t enjoy something so singular, striking in its brevity. Why don’t more people read poetry too? Similar reasons. The statement is true though, and fewer people are reading overall. Bookstores are closing, or moving into smaller spaces as rents begin to rise. What is a film? Dare I say a film is only a short story—a condensed version of a novel. Usually most film adaptations aren’t as good as the book or source material. Here are a few exceptions, but short stories as source material for feature films always interests me. Brokeback Mountain was based on a short story by Annie Proulx, and Larry McMurtry and Diana Ossana wrote the Oscar-winning screenplay. The Killers was filmed to great success, and came from a very good Hemingway short. Original screenplays only start with a single idea. Those are usually the ones taking all the risks and are the most original. Take a curious idea and give it voice, tighten the prose; construct your paragraphs and allow the characters to go where they want to go. Play that idea out as succinctly as possible — make each word count, give it weight, and a terrific short story may be born. I read a short story each night, and have been doing this for a very long time. Most collections have ten stories in them, like my own. So, that’s ten nights of reading. After I read the short story I dig into a good book. If you love short stories, or even if you don’t, please tell me why. Who are your favorite writers of short tales? I read all genres. If writers can master the art of the short story, then they are ready to shoot for a longer work, stretch out their narratives, give their characters some meat to eat to last a whole season, or maybe even just one day. To purchase Sandcastle and Other Stories, please click this link HERE. The link will take you to my Amazon Author Page. While there please take a look at my first Green Darner Press novella, a psychological thriller, The Conversationalist. You can also choose to download a Free Sample, which includes the opening of the first story, The Virtue of Minding Your Own Business. While at Amazon, please hit the Like button. This is a nice way to show support for your favorite authors. If the collection hits you well, please consider writing a review at the Amazon book page, and let me know what you think. 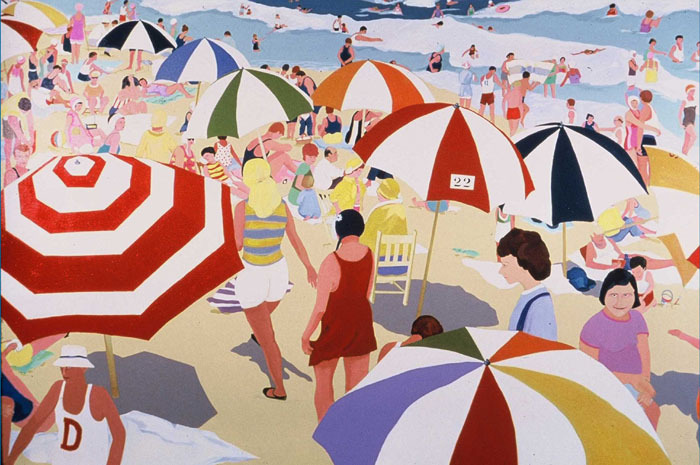 This painting is by my father, George Bogdanovitch, and his art, along with my late mother’s art (the cover of The Conversationalist is one of my mom’s paintings), can be seen by clicking HERE. Please subscribe to A Writer’s Life Blog or simply hit the Follow Button to the right. You can now subscribe to my newsletter by email. Follow me on Twitter @JustinBog. Like my Author Page on Facebook. Check out the e-Magazine In Classic Style for updates on travel, Leisure, and Entertainment. For all of your Apple/Mac needs or WordPress and Multimedia Publishing please contact: Convenient Integration. Hi Justin! Congratulations on your release. I read many different genres but my faves are definitely the crimes thrillers, anything with a psychological and suspense angle grabs my attention. I do read both shorties and full length novels, but probably more of the latter because I love to get lost in the story and make it last as long as possible. Sandcastle is a wonderful collection and I wish you all the best with it – hope they fly off the shelves:) My review is on Amazon UK. That’s so great, Jane. My mind takes me to enjoy psychological suspense the most (throw in a little horror to jolt) — I blame the great film Psycho for leading me down this path. Justin, so thrilled for your success with Sandcastle and Other Stories. I’ve only known you a short time but consider you a good friend and stellar writer. My first book was 4 novellas, and I really didn’t know if it would sell — but it has. I love the genre of shorts so long as they are well written. It’s actually not easy to write flash or shorts because many of the elements that are required for a full length novel are also needed for a short story – some people can’t think in ‘short spurts’ – You and I obviously can. At the end of day, it’s most important you write in the genre and style you love. I believe sales will follow based on the quality of the work. Congratulations, Justin! I can’t wait to see the movie(s)! Nor can I wait until June for the paperback to come out. I love short stories. Obviously. Thank you, Judy. What a great weekend! I hope you managed to have a wonderful Mother’s Day. Wouldn’t it be awesome if someone wanted to make Sandcastle into a short film. Really calls out for that. It’s very cinematic. Congratulations, Justin! I wish you tons of luck with Sandcastle and Other Stories. Yes, people are less likely to read short stories. Your post made me question why I’m one of those people. Very interesting stuff, as per usual. You know that I will support you in this endeavor by going heavy on the RTs! Woot woot, Kelley. I love heavy RTs too! These short stories called to me and none of them felt like a novel. There’s only one story here where I’ve thought of continuing another tale centered on a peripheral character, and that is Typecast. Fun to get things down on paper and to share them as an eBook. Love that you came and visited. I tell you many times before how much I love your writing and I think that everybody knows that I read everything you Post…here or in other blogs. We both know that I read almost all the stories…still, seeing your book out there doing so good wasn’t a surprise to me…I knew that from the moment I read your crazy Santa story 6 month ago. As you can see Justin not just some but many people notice your book!!!! I can’t wait to see the paperback!!! I personally love short stories as much as novels. I appreciate how hard they must be to write: juggling the need to keep it short yet engaging enough to grip the reader from the outset. I find, with attempting and coming to the end of my first novella that this is a difficult juggling act. Thank you very much for your thoughts, Bex. I absolutely love a good, detailed, rich, suspenseful short story. I try to read as many as I can. Every word has to be sharp, placed there for a good reason . . . tight. There’s time in a novel to go into more detail, plot layering. I like to concentrate on character, and eavesdrop on interaction, write down what I see and hear. Please let me know what you think when you’re finished reading. Best to you. Justin, I was never a reader of short stories, until I became a writer of them. I just finished Sandcastle and other stories, and will write a review in the next while. Loved them all. A couple are standouts – for some reason “Poseidon Eye’s” even though it is very Stephen King-like, and I am not a fan of his, and Sandcastle. Heck of an ending. Made my skin crawl. My short stories tend to be VERY short, most under 1500 words, so it’s interesting to read longer shorts. Thanks for sharing your thoughts on the tales, Julie, and on the short story form. Writing is a gamble, and sharing the inner thoughts of off-center characters is often tricky. Will that character resonate with a reader? The actions, even if morally questionable? I love your short stories, Maria. The same amount of care and detail need to be utilized. Can’t wait to read more of your work. Loved this collection of short stories! Absolutely thrilled to have the paperback on my bookshelf!